I just want to climb into that picture and give him a huge hug!!! Those Robes are even worse than I imagined! And, I'll admit I'm a little surprised with the 'tux' on Harry. I wonder if they'll be wearing 'robes' or pants? Yeah, Harry looks great ... the tux does kind of surprise me and sort of doesn't seem .. fair somehow. Not sure if fair is the word I want but ... in the books his dress robes are much nicer than Ron's obviously but ... a tux?? It seems over the top. I actually visualized Ron's robes being kind of like that when I read the book, though I'm getting the impression I'm one of the few people who did from my friends list. Harry's not wearing a tux, that's "white tie" -- the utmost in men's formal evening dress! For a tuxedo he'd have a black tie and no vest, with a short jacket. White tie goes with a long coat ("tails"), so it will look just fine with robes. Well, from what I can see in this photo, Harry's coat looks reasonably full - as though it could be long and cloak-ish. And I really want them all in dress-like costumes. I'm just a tad concerned that poor Ron will be the only one relegated to wearing a 'dress'. For it's comedy value. And I'm a wee bit disappointed that Harrry's suit is not dark green. But not surprised. Thanks for the white tie/black tie info though! I'm still up at 2am because I can't stop squeeeeeing! Oh the twins are going to wet themselves! I have washing to hang out and gingerbread houses to build! I did finish a gift Malfoy pic this morning tho, so that's something. I still have post it though, and I can't tear myself away from the fandom!! So much joy on one day!!!! but I think they got it from WBros. oh. my. GOD!!! That is fabulous! bwahahahaha! LOVE. OMG IT'S MORE ADORABLE THAN I CAN HANDLE!! I know! I think I might just explode from all this fannish goodness!!! oh hahaha omg hahahaha poor ron XD awwwwwwwww! this is the best pic ever!!!!! What a fantastic pic! The robe is WORSE than I'd imagined! lol As for Harry's robe, I think the tux look is fine--it IS a dress robe, after all. Fudge wore a pin-stripe robe/suit and it looked fantastic. Oh, and besides, Molly would never let it get that long! Bill is one thing, but Ron is still firmly under her thumb. Yes, but as Bill won't be in the film, I suspect they're shifting the 'long hair storyline' to Ron. Wow, it's Rupert Grint expression #45a! But doesn't Daniel Radcliffe look such a darling?! LOLZ! *rolls on the floor laughing* Oh my.......their expressions are priceless! 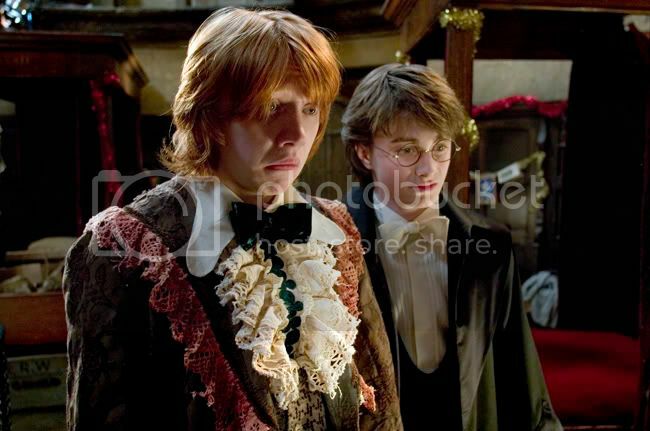 Lolz, and they're yule ball clothes! Lolz! That's so awesome, I can't wait for the movie to come out! has anybody noticed that he looks kinda like Austin Powers?